“The greatest known concentration of mechanical power in ancient world” – this is what the watermill complex of Barbegal has been referred to as. Located in the small commune of Fontvieille near Arles, the Aqueduc Romain de Barbegal is another wonder the Romans left for Arles. Every inch of the stones and bricks that make up this place are etched with beauty and marvel. The splendid structure was made to serve two purposes. 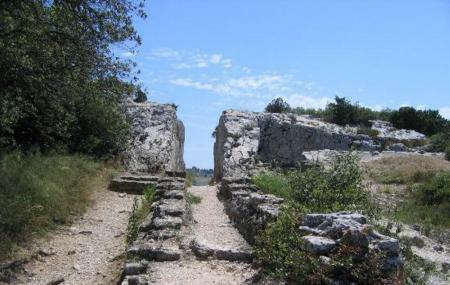 The first was to supply drinking water from the striking mountain ranges of Alpilles to the city of Arles. The second was to power the great flour mills of Barbegal. It is believed that the ancient mills were operational from the start of 1st century until the end of the 3rd century. The site is full of lovely olive trees bearing its fruits and makes an excellent picnic spot. Presently, ruins of the mills makes Roman history come alive in lush green spaces. A lovely place to walk through, one must definitely follow the structure from the road to the edge of the hill. Tucked in a quite realm, the site provides a rather gorgeous view of the neighbouring farmlands. How popular is Barbegal Watermills? People normally club together Eglise Saint Vincent and Cargo De Nuit while planning their visit to Barbegal Watermills. A personal favorite of mine. A long line of ruins datinh back to Roman times. The site is not developed at all and access is free and easy. Follow the ruins up and back to the mill site on a sunny day and you will be amazed with the view. You can stop easily with the car or combine with a hike from Fontvielle (recommended). This is another example of Roman engineering. Although not completely intact it is still worth looking at if you are in the area. The wall goes for quite a distance so have a walk or ride your bike along the path that follows the wall. Very interesting. Easy access from Fontviwlle. Really nice ruined part of a roman aqueduct. You can walk around freely and i didn't see a soul, even during peak season. The small and missible parking lot alongside the road even has video surveillance, even though you won't leave your car for longer than 15-20 min. Worth a visit. Be sure and walk out to the end where the mill once was.